Liver inflammation, causes, Hepatitis, Haemochromatosis, Drug use etc. Liver inflammation, how do I cope when it happens? Before I explain what Liver inflammation is, let me tell you that I personally think the liver has a great deal to do in order to keep us alive. The liver can be compared to a filter in a large industrial vacuum or the filter in the furnace in our home. The filter helps keep the air quality inside of the home safe for us to breath. If we do not clean the air filter it will cause us to get sick. Sometimes very sick. The vacuum filter needs to be cleaned to work well, the same is true of the liver. Therefore it is very important that we also clean the liver and gall bladder from time to time. Doing this will help keep us healthy. The word Hepatitis means Liver inflammation. Hepatitis is one of the four major ways we can have inflammation of the liver. The other way is drugs. Toxicity caused by excess use of drugs can overload the liver. The third is the excess use of alcohol. The fourth is very poor digestion. When flow stops or it slows down then our liver can become toxic and over burdened. Poor digestion can stress this organ, as it can our other organs. 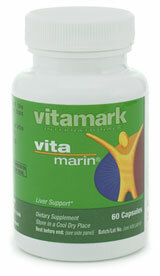 Vita Marin can help the liver and gallbladder to increase the flow of bile. Which we all need to break down and digest fats. It also will stop toxins from binding to the liver cells. Some of the other causes of Liver inflammation can be infections like mononucleosis and parasite infections, haemochromatosis which is iron overload of the liver, (the body cannot process iron and it builds up in the liver) which leads to inflammation of the liver, heart and pancreas. If our liver could talk just about now what would it be saying to Us! The liver can handle the normal functions that take place but can find it very hard to do those things if it becomes inflamed. What are some of the many things the liver does for Us? # 1- The manufacture of and secretion of bile. Bile is stored in the gallbladder. Waiting for us to have that favorite meal. Then the bile salts process or emulsify fats we eat. # 2- The liver also metabolizes the protein and the carbohydrates we eat. It stores glycogen and vitamins. # 3- It's other functions are the destruction of old or damaged red blood cells. # 4- It regulates our blood volume. # 5- Our liver plays a major role in the production of enzymes. We certainly need enzymes to help us digest our food as well as other processes that go on in our body. VitaMarks Phospho-lipids a source of essential fatty acids. Phospho lipids support, liver function. They are for those of us that are concerned with degradation of the myelin sheath, like you would see in Parkinson's and Multiple sclerosis disease. Liver concers, due to a toxic overload or alcoholism. Those of us that are concerned with the function of the brain and momery. # 6- It removes toxic waste matter from our blood stream. This is where we can help the liver to do a very good job at keeping us healthy. We can help the liver, kidneys, bowels and skin to cleanse and restore itself by eating raw foods. Raw foods take a great deal of stress off of the liver. We can always look at our outside appearance to see if we are aging, but if we took pictures of our liver what would it look like in terms of health and long life for us? Liver inflammation is an important issue when it comes to how healthy we really are, and how long, some experts say we will live. How do we get to have Liver inflammation? Hepatitis-A is thought to be spread by a virus. This virus lives in the stool of infected individuals. That is why it is important to wash our hands after using the washroom and cleaning all the surfaces of the home. Hepatitis-B is spread through blood transfusion, or coming in contact with a persons blood, open wound, or needles. This also can be passed on from Mother to newborn. Hepatitis-c is transmitted through blood transfusion, sharing needles razors, unsterilized tools. How to prevent or lower your risk to some of these kinds of Liver inflammation. Do not drink water from areas you know nothing about, that also goes for shellfish. These can be contaminated by sewage. Use antiseptic anti-bacteria cleaners on all surfaces, including toilets, and sinks. It is very important to prevent Liver inflammation in these ways. What can we do to control inflammation of the liver? Once a person has this condition there are things to do to get and stay healthy. In general an anti-inflammatory diet will improve the fire within the liver. The Holistic way to bring some balance back to the body is to cleanse. The one thing I like to do is take the juice of one half of a lemon with hot water and drink it every morning. It's like saying to my liver wake up, it's time to face the day. A liver cleanse is a good thing to do. If you want to do an olive oil cleanse, do the parasite cleanse first. Then do a bowel cleanse. The colon needs to be clean and moving well before doing a liver cleanse with olive oil. Step one is do a parasite cleanse. Step two is do a colon cleanse. Step three is cleanse the liver. Step four is cleanse the bowels again so that the colon and blood stream does not reabsorb the toxic waste from the liver. Black Walnut, Wormwood and Cloves are all good to kill different kinds of parasite we can get. I also eat pumpkin seeds the oil is great for killing parasites. Liver inflammation no matter from what source can be helped by taking a pro active roll in your health. If you would like a very good gall bladder cleanse click on the words gall bladder at the top of this page.